Which are Good Quality Paints? Firstly it should be made clear that we are an independent website offering guidance on an impartial basis. Consequently the information given in this section on paints is our own personal opinion based on experience in the painting business and we are not sponsored by any specific paint manufacturer. There is a reason Dulux is one of the most popular brands of paint on the market – it is a name that is synonymous with quality. In general terms, at the top of the league of paints are four names – Dulux, Crown, Johnstone’s and Farrow and Ball. Dulux comes in two forms, standard and trade, as does Crown, while Johnstone’s is a predominantly trade paint and Farrow and Ball comes in only one standard, high quality form. For external paint, there are two principal brand names. Dulux produce Weathershield while Crown produce Sandtex. These are the best of exterior paints that offer good coverage as they are not watered down, and Weathershield especially has fungicidal properties for added protection. Part of the excellent quality of these paints is that they still allow masonry to breathe, while remaining totally water repellent. They are durable, usually lasting a good 5 years, and they retain their colour rather than fading in bright sunlight as some cheaper paints will do. Internally, you should know that major brands do a 'trade' version of emulsion paint for walls and ceilings, and the quality of this paint is infinitely superior to the same brand you can buy in a DIY superstore. Trade paints can be bought at major builders’ merchants which, if you didn't know, will happily sell to members of the public, not just tradesmen. These trade paints are thicker and usually require diluting by up to 20% to provide a paint that is easy to work with. They cover the walls with a slightly thicker coat of paint, are usually more durable, especially the vinyl matt and vinyl silk paints, while also retaining their colour over a long period of time. Dulux, Crown and Johnstone’s all do a trade paint. Farrow and Ball are the Harrods of the paint world. They produce paint of exceptional quality and have a range that includes what are referred to more as heritage, or deep and rich colours. 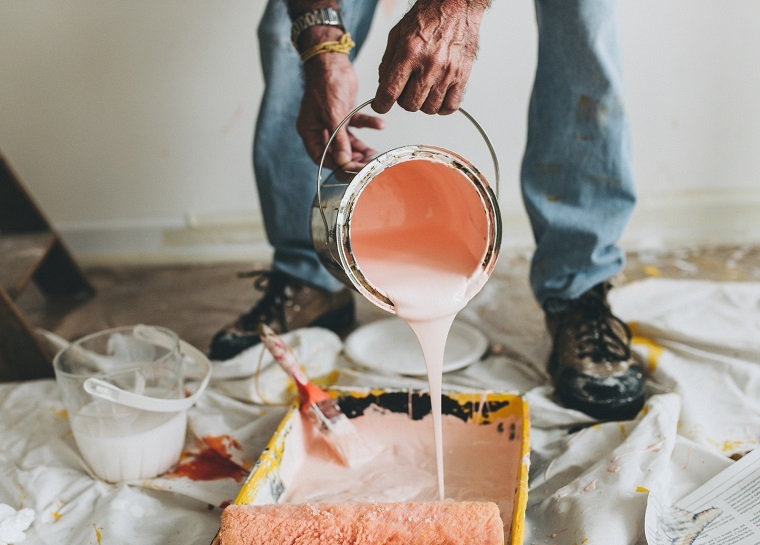 It is useful to know that if you are painting a brand new property with bare plaster or plasterboard wall, the cheapest trade paint is perfect to use for a 'mist coat' as all you want is a thin coat of paint to seal the surface and it is not worth the expense of using top quality paint, even if it is watered down 40%. Also see: Types of Paint. When it comes to paint for woodwork, once gain quality paint is essential, especially when considering white gloss paint. This is a paint with a high oil content and cheaper versions of gloss paint will turn yellow very quickly, while the four principal brands mentioned will not. Once again, other than Farrow and Ball, there are trade versions of all these paints – gloss, satinwood, eggshell, primer and undercoat - and again these are the highest quality. A few names spring to mind when referring to treatment of external woodwork, Sadolin (part of the Crown Group) produce top quality stained varnishes for window frames and doors, while Dulux Weathershield also produce quality external wood paints. Cuprinol and Ronseal are two quality brands who produce products ideal for painting wooden structures like decking, sheds and fencing, these usually having a preservative element to them as well as adding a splash of colour. How to Choose Paint Colours? Have a look at this video to get some tips on how to choose paint colours.